Christmas dinner is a fairly standard meal. Tradition dictates that it mustn’t vary much … turkey, roast potatoes, a couple of vegetables, some things like cranberry sauce that nobody really likes and stuffing. There has to be stuffing of some sort, officially as part of the meal itself, but more importantly to have ready, cold in the fridge for picking at on Boxing Day and stuffing into an over-sized sandwich along with too much turkey. Reconstituting a packet of Paxo just wouldn’t show enough effort for Christmas Day, especially as making a good stuffing is very straightforward, more a process of mixing and tasting than actual cooking. There are hundreds – thousands – of variations, and this is simply my attempt to lever some black pudding into the Christmas feast. As it’s pork-based and quite dense, this stuffing will firm up and become almost terrine-like on cooling … you’ll be able to slice thick chunks and serve them with cold meat, cheese and the like. All of these ingredients are fluid and changeable – mix things up as you see fit, or depending on what you’ve got available, but always start with 500g of good pork sausage meat, either the sort you buy in fat cylinders just for the purpose of making stuffing, or from skinning a pound or so of good butcher’s sausages. In a frying pan, melt some butter and fry two finely chopped onions very slowly until they’re soft, but not browned. The onions shouldn’t colour, just wilt. Fry four or five rashers of streaky bacon, chopped into small pieces, along with the onions, and then add the contents of the frying pan to the sausage meat. Add three or four generous handfuls of fine breadcrumbs, about 100g of finely chopped walnuts, the zest of a lemon, a big pinch of ground mace, the leaves from a small bunch of thyme and five big sage leaves, finely chopped to the sausage meat. Break two eggs into the dish and mix it all together very thoroughly, seasoning well. Go heavy, but carefully, on the seasoning – it needs some backbone and a pronounced smack of salt. Chop 250g of black pudding into small cubes and gently mix into the stuffing. The black pudding will crumble and collapse to some extent, but some pieces will stay intact, studding the stuffing with dark jewels. Fry a small piece of stuffing in a frying pan and taste it to check the seasoning, adding more salt and pepper, or more thyme and sage, maybe some lemon zest, if you think it needs it. 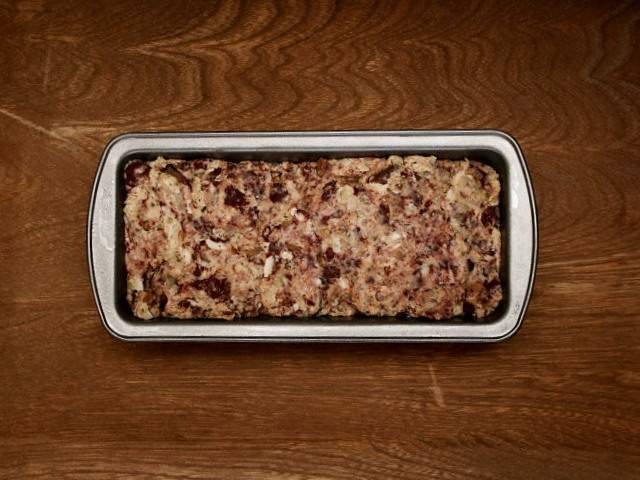 Pack the stuffing into a greased loaf tin, cover with foil and bake for about an hour, until properly cooked through. Take the foil away for the last twenty minutes if you want the top of the stuffing to crisp. This stuffing is earthy and subdued. It doesn’t have the grandstanding zing of a stuffing made with fruit added to it, just a deep savouriness and richness that sits well beside turkey.